12 January 2019, Abu Dhabi: The UAE Pro League Committee has become an official media partner of Special Olympics World Games Abu Dhabi 2019, following the signing of a Memorandum of Understanding (MOU) today. The agreement will support efforts to raise awareness of the world's largest sports and humanitarian event with football fans across the UAE. Being held between 14-21 March, Special Olympics World Games Abu Dhabi 2019 will see 7,500 athletes from a record 192 countries participate in the most unified Games in the 50-year history of the Special Olympics movement. As part of the agreement, Special Olympics World Games Abu Dhabi 2019 will have the opportunity to display TVCs in advance of the event inside the stadiums of all Arabian Gulf League matches, on big screens and LED displays. In addition, the UAE Pro League Committee employees will have the opportunity to meet with volunteers and athletes participating in Special Olympics World Games Abu Dhabi 2019. Employees and their families will be invited to participate in community sports events including the Unified10K and Play Unified events at the World Games, as well as a host of other benefits. 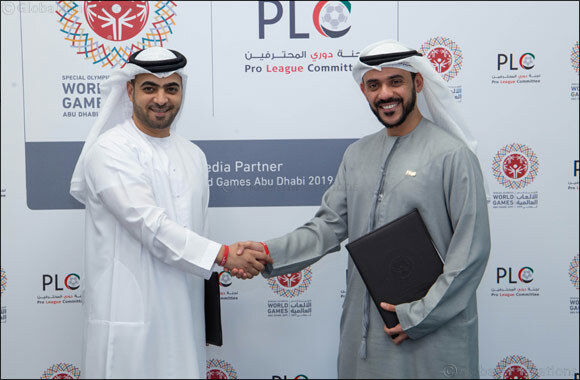 In turn, UAE Pro League CEO Waleed Al Hosani expressed his delight at the signing of the MOU with the Special Olympics World Games - Abu Dhabi 2019. 'WE were keen to sign this agreement in line with our 2017-2020 strategic plan which focuses on activating strategic partnerships with various sections of society and supporting sporting events hosted by the UAE,' said Al Hosani.